The world will possibly end this week on December 21st according to various interpretations of the Mayan calendar. I’ve seen quite a few of the Mayan ruins in the Yucatan and they are impressive. Who is to say the Mayans might not be right? One could simply sit back, sample a few craft beers, gaze at the stars, and ride out the cosmic happenings. As tempting as that sounds, I’m a proactive type and thought that a blog post about an aptly titled book would be more stimulating. This forgotten gem came my way via Ebay. The author of the work, by all accounts, carried huge promise, and the creativity surrounding the entire production hints at what might have been had his life not been cut tragically short. As for us, let’s hope the Mayan calendar interpretation is wrong. I sure would miss the occasional vacation to Cancun. [Frederick B. Kaye]. 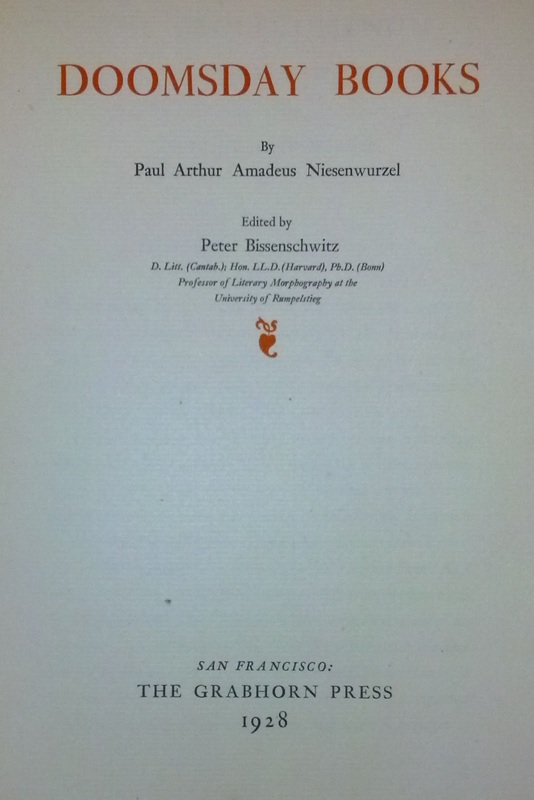 Paul Arthur Amadeus Niesenwurzel. DOOMSDAY BOOKS. San Francisco: The Grabhorn Press, 1928. Edited by Peter Bissenschwitz. [vii] 9  p. Folio. Light green plain jacket over paper boards. Erratum slip tipped in. Limitation: 150 copies. Notes: Printed by Herbert L. Rothschild for members of the Roxburghe Club. The described binding seems to have been the standard issue. Included also in my acquisition are two other copies: a binding variant in brown quarter cloth and marbled boards with printed paper spine label, and a copy in unbound sheets. “Niesenwurzel’s” essay hypothesizes that of the making of books there is literally no end and eventually the mass of books will leave no room for any other material. Everything from homes to cars to clothes will have to be made out of books—each utilizing books with subjects pertinent to the item. The world of scholarly writing and research is lampooned with vigor and the “Bissenschwitz” notes add sauce to this finely cooked literary hoax. 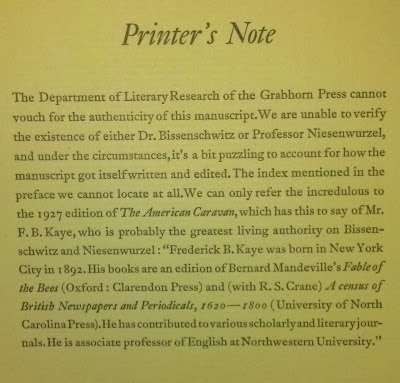 Frederick B. Kaye (1892-1930), associate professor of English at Northwestern University, was both the author (Niesenwurzel) and editor (Bissenschwitz) of the work. 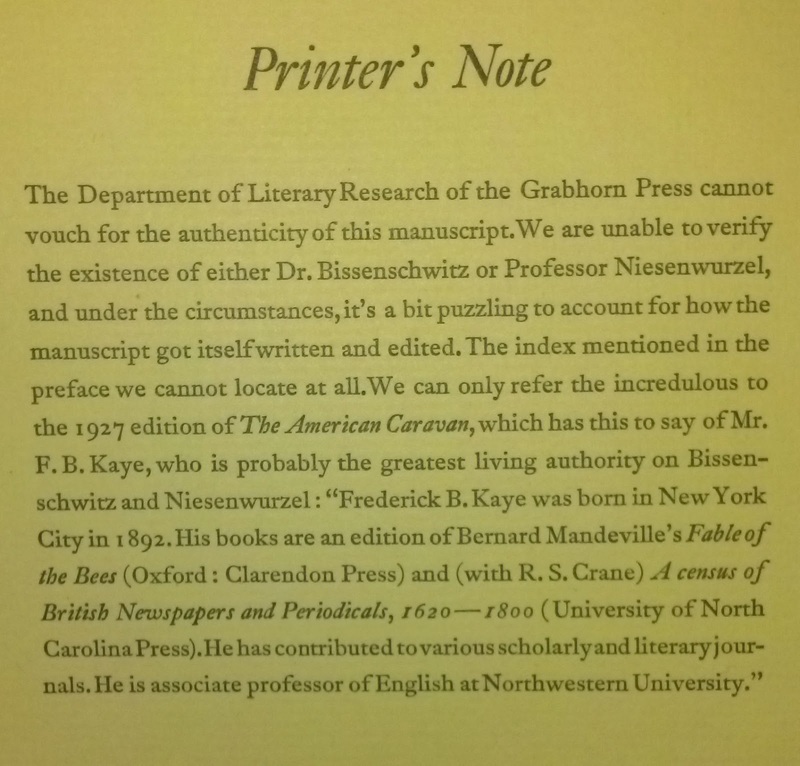 The “Prolegomenon” with Kaye’s initials and the amusing Grabhorn "Printer's Note" spills the beans about Kaye’s authorship. Kaye changed his last name from Kugelman in 1919, presumably in the wake of the anti-German sentiment surrounding WWI. He was a Yale undergraduate of 1914, M.A. 1916, and Ph.D in 1917. Kaye joined the U.S. Navy in WWI and afterwards became a highly popular English professor among his students at Northwestern, a rising star in academia. According to one online recollection by a former student he came from a family of independently wealthy German Jews and taught purely for the love of literature and research. His professional publications centered on the works of Bernard Mandeville (1670-1733), philosopher, economist, and satirist. He also authored with R.S. Crane an important bibliographical work, A Census of British Newspapers and Periodicals, 1620-1800 (1927). As he entered the prime of his teaching and writing Kaye was diagnosed with an inoperable brain tumor. He died in 1930. His books went to Northwestern and a collection of his papers are at Yale. This work certainly has a Borgesian flavor, or rather a pre-Borgesian flavor, as Borges had not yet published his famous Ficciones. But perhaps there is a connection between Borges and Kaye and a few years of subsidized research and travel to various archives would result in an article for an obscure journal. This would be read by the scholar’s friends and colleagues out of obligation. Or the article remains unfinished and the scholar turn it over and over in his mind until it assumes an importance well beyond the scope of this paragraph. Either way, the line for the grant money would be long.